There is substantial epidemiological and mechanistic evidence that the increase in allergic disease and asthma in many parts of the world in part relates to changes in microbial exposures and diet acting via the composition and metabolic products of the intestinal microbiome. The majority of research in this field has focused on the gut microbiome during infancy, but it is increasingly clear that the maternal microbiome during pregnancy also has a key role in preventing an allergy-prone immune phenotype in the offspring. The mechanisms by which the maternal microbiome influences the developing fetal immune system include alignment between the maternal and infant regulatory immune status and transplacental passage of microbial metabolites and IgG. Interplay between microbial stimulatory factors such as lipopolysaccharides and regulatory factors such as short-chain fatty acids may also influence on fetal immune development. However, our understanding of these pathways is at an early stage and further mechanistic studies are needed. There are also no data from human studies relating the composition and metabolic activity of the maternal microbiome during pregnancy to the offspring’s immune status at birth and risk of allergic disease. Improved knowledge of these pathways may inform novel strategies for tackling the increase in allergic disorders in the modern world. The co-evolution of animals and their commensal microorganisms has resulted in a symbiosis in which the enteric microbiome provides essential stimuli for the maturation and function of the immune system . Accordingly, there is an intense interest in the relationship between taxonomic depletion and altered metabolic activity of the gut microbiome [2, 3, 4] and the concordant increase in immune-related disease in Western societies [2, 3, 4, 5]. 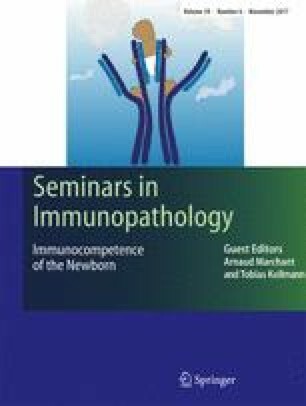 It is well recognised that the infant’s microbiome during early postnatal life plays a central role in healthy immune development, but there is also mounting evidence that the maternal microbiome during pregnancy has a profound impact on fetal immune development and in turn the infant’s predisposition to allergic disease and asthma. It is a teleologically appealing proposition to consider the mechanisms that may exist to prepare the infant for the microbial and antigenic environment that will be encountered during and following birth. Does the mother ready the developing infant for the specific environment they will be born into and are the changes in the maternal gut microbiome during pregnancy  relevant to healthy fetal immune development? The aim of this review is to consider current thinking and evidence regarding the mechanisms by which the maternal gut microbiome during pregnancy influences fetal immune development and the potential relevance of these pathways to the prevention of allergic disease. There is substantial evidence that exposure to a farming environment during early life is associated with diverse bacterial experience and reduced risk of allergic sensitisation and asthma . In the PASTURE study, it was shown that living in a farming environment was associated with both increased environmental endotoxin and reduced asthma incidence . Building on this, the PARSIFAL  and GABRIELA  studies confirmed that children living on farms had a lower prevalence of asthma and other atopic disease in comparison to children from suburban areas, and that this association related to increased exposure to environmental microorganisms in farming homes . Further analysis of these studies indicated that the effect on asthma was largely explained by exposure to cows, straw, consumption of raw cow’s milk  and exposure to livestock . Although it seems likely that contemporaneous exposure to a microbially rich environment prevents the expression of allergic disease in children , maternal exposures during pregnancy are also likely to be relevant. In PARSIFAL, maternal exposure to stables during pregnancy was clearly associated with decreased allergic sensitisation amongst the offspring, whereas current exposure had much weaker effects . Consistent with this, a large cross-sectional study found that the protective effect of prenatal livestock exposure on risk of asthma and hay fever symptoms remained unchanged following adjustment for postnatal exposure, whereas the protective effect of livestock exposure during the first 2 years of postnatal life was substantially attenuated by controlling for prenatal exposure . Of note though, these and other related epidemiological studies are limited by high levels of correlation between pre- and postnatal microbial exposure, making it difficult to tease apart the importance of the two periods. Moreover, environmental exposures provide only a proxy for the maternal and infant microbiome, and there are currently no published human studies which enable independent evaluation of the importance of prenatal maternal and postnatal infant microbiomes to the prevention of allergic disease. A range of studies have established clear links between differences in innate and adaptive immunity at birth and subsequent allergic disease and asthma, which suggests that in utero immune development is likely to be relevant to the prevention of allergy and asthma. In the 1990s, several studies reported links between decreased IFNg (Th1) responses in cord blood mononuclear cells and subsequent allergic disease [17, 18, 19]. Subsequent studies have established links between increased innate immune responsiveness [20, 21], deficits in regulatory T cell number, function and responsiveness [21, 22, 23] and subsequent allergic outcomes. While there is insufficient evidence to show that the association between microbial exposure during pregnancy and decreased allergic disease in the offspring is mediated by these immune parameters in the newborn, it is clear that infants of mothers exposed to a farming environment display different innate immune gene expressions  as well as increased number and efficiency of regulatory T cells . Alignment between maternal and infant immunity may be one mechanism linking the maternal microbiome to the offspring’s risk of allergic disease. There is a substantial body of evidence supporting transplacental immune regulation during pregnancy. Maternal IgGs loaded with e.g. microbial components from the mother cross the fetal–maternal barrier by an active process from 13 weeks gestation , conveying temporary passive immunity  and influencing fetal innate immune development . In contrast, cellular components are generally separated by the placenta, with some leakage in both directions without preference toward a specific cell type . This cellular leakage is functionally important, as maternal cells residing in fetal lymph nodes induce fetal regulatory T cells that suppress antimaternal immunity . Transplacental immune regulation may be further mediated by cytokines, hormones , through bacterial products such as short-chain fatty acids  or lipopolysaccharides (LPS) [33, 34]. Santner-Nanan et al. have demonstrated a strong correlation of peripheral blood Treg cells between the mother and the fetus . In contrast, there was no significant Treg cell correlation between the father and the fetus, implicating that the specific context of pregnancy, i.e. the placental environment, rather than haploidentical genetic parental similarity to the fetus, is responsible for this correlation. Maternal infant alignment in Treg cells appeared to be mediated by IL-10, a pleiotropic cytokine with potent immunoregulatory properties . Treg cells are characterised by increased expression of the IL-10 receptor-α (IL-10RA), making them more sensitive to the effects of IL-10. The IL-10 regulates Bcl-2 expression in Treg cells, which could contribute to Treg cell survival in both the mother and the infant . In the context of alignment between maternal and infant Treg, it is relevant to consider emerging evidence linking pregnancies complicated by preeclampsia with increased risk of asthma and allergic sensitisation in the offspring . Impaired growth of the fetal thymus precedes the onset of clinically detectable preeclampsia ; and preeclampsia has been associated with decreased peripheral blood Treg in both the mother  and newborn . One potential shared antecedent is the maternal microbiome and its metabolic products, including short-chain fatty acids (SCFAs). Over recent years, there has been an intense interest in the relationship between diet, the composition and metabolic products of the intestinal microbiome and immune-related disease . In particular, it has been clearly demonstrated that bacteria in the large intestine ferment dietary fibre to produce SCFAs, which in turn have a profound influence on a range of inflammatory diseases [42, 43], Treg biology [44, 45, 46], dendritic cell (DC) biology [42, 47] and/or epithelial integrity [48, 49]. To date, however, only one study has directly investigated the relationship between maternally derived SCFAs and fetal immune programming. Thorburn et al. found that pregnant mice fed on high-fibre diet or treated with the SCFA acetate in drinking water during pregnancy had offsprings protected from allergic airways disease . The beneficial effects of fibre and acetate were mediated in utero as supplementation during lactation had no effect. These beneficial effects were mediated through epigenetic effects with acetate increasing H4 acetylation in the FoxP3 promoter region, which correlated with increased Treg numbers in both mothers and offsprings. High-fibre-fed and acetate-treated pregnant mice had fetuses with differential gene expression in the lungs compared to control mice. There are currently no equivalent data from human studies. Maternal IgG may play a key role in mediating the association between the maternal microbiome and fetal immune development. Of the five immunoglobulin classes, maternal IgG is the only antibody that significantly crosses the human placenta [26, 50]. The active transport of IgG occurs via the neonatal Fc receptor (FcRn) within the syncytiotrophoblast (ST) cells at the surface of the chorionic villi of the placenta. Once bound to the FcRn receptor, IgG is packaged in endosomes and protected from degradation until it dissociates into the fetal circulation [50, 51]. This materno-fetal IgG transport is an important mechanism that confers passive humoral immunity to the fetus, so that after birth, the infant is protected against infections while its own immune system develops [26, 50]. Allergen-specific maternal IgG also plays a role in the induction of immune tolerance in infant . Until recently, maternal IgG transfer during gestation had only been linked to fetal humoral immunity, but there is now good evidence that maternal IgG also plays a crucial in fetal innate immune development . Aguero et al. colonised pregnant germ-free mice with a genetically engineered Escherichia coli with a limited lifespan, such that the mothers were germ free again by the time of birth. Colonisation with E. coli during pregnancy increased the numbers of innate leukocytes (NKp46 + innate lymphoid cells (ILC)) within the offspring Peyer’s patches during the postnatal period. At the same time, maternal carriage of E. coli was associated with attenuated inflammatory responses (TNF-α and IL-6) to stimulation with LPS, which may be relevant to the prevention of the hyperresponsive innate phenotype associated with allergic disease in humans [20, 21]. Similar effects in the offspring could be produced if germ-free dams were infused with serum from E. coli colonised mothers, but not if the serum was depleted of IgG. Further to this, maternal antibodies enhanced the retention and transmission of targeted microbial molecules produced by the E. coli, and these molecules were responsible for the increase in offspring innate leukocytes . The maternal intestinal microbiome may also confer protection against allergic disease and asthma in the offspring via TLR-dependent pathways . Interactions between bacterially derived LPS (endotoxin) and TLR4 are of particular interest given consistent evidence that associations between microbial exposures and allergic outcomes in humans are modified by polymorphisms in the TLR4 gene [53, 54, 55, 56]. However, the relationship between LPS exposure and allergic diseases is complex, with some epidemiological studies finding that environments with high levels of endotoxin are associated with decreased allergic disease [14, 57], while others link endotoxin exposure to increased allergic disease . This may relate to diversity amongst LPS molecules in regard to their TLR4 stimulatory capacity [59, 60]. Several different endotoxin isoforms have been identified that vary in the extent of acylation of the TLR4-binding lipid A portion of the molecule. While the penta-acylated lipid A variant produced by many bacteria confers a degree of TLR4 inhibition, the hexa- or hepta-acylated lipid A variants are potent stimulators of TLR4 signalling, resulting in promotion of T helper type 1 (Th1) responses [61, 62]. Moreover, immune cells may mount Treg, Th2 or Th17 responses following exposure to stimulatory LPS, depending on the presence of various other immunoregulatory ligands . Bacterial isolates from farming environments (cow sheds) have high levels of stimulatory (hexa- or hepta-acylated lipid A variants) LPS variants . Increased Treg numbers and suppressive functions in offspring of farming mothers  may reflect an interaction between Th1 driving stimulators and immunoregulatory mediators. More specifically, it is an intriguing possibility that the maternal microbiome may provide immunostimulatory components such as hexa-acylated LPS, in combination with immunoregulatory microbial metabolites such as SCFAs, to promote Treg development and immune tolerance in the developing fetus. Given the increasing evidence that infant gut microbial composition plays a pivotal role in the development of immune responses, probiotic and/or prebiotic supplementation during pregnancy and infancy has been investigated as an approach to modify early gut colonisation and prevent allergic diseases. Probiotics are defined as ‘live microorganisms that, when administered in adequate amounts, confer a health benefit on the host’. The most widely used probiotic bacteria are from the genus Lactobacillus and Bifidobacteria. Prebiotics are defined as ‘a selectively fermented ingredient that allows specific changes, both in the composition and/or activity in the gastrointestinal microbiota that confers benefits upon host well being and health’. The term synbiotic refers to combination of probiotics and prebiotics. Recently, high-quality meta-analyses have concluded that probiotic supplementation, when administered during both the prenatal and postnatal period, is effective for prevention of eczema, IgE associated eczema, atopic sensitisation and food sensitisation, particularly in infants with a family history of allergic disease [65, 66, 67]. There has however been just one study evaluating probiotic supplementation (with Lactobacillus rhamnosus GG) during the prenatal period alone which showed no beneficial effects for prevention of eczema, IgE associated eczema, atopic sensitisation or food sensitisation . Meta-analyses of probiotic administration solely to infants during the postnatal period have yielded conflicting results with some finding no beneficial preventive effects on eczema  or increased risk of atopic sensitisation . These findings suggest that a prenatal component of treatment is important for beneficial effects, highlighting the important influence of maternal factors in infant immune programming. Most probiotic prevention studies have involved infants at increased risk of allergic disease due to presence of allergic disease in a first-degree relative, so it remains uncertain whether probiotic supplementation will be effective in infants without a family history of allergic disease. The use of probiotic mixtures appears to be more effective than single species of either Lactobacillus or Bifidobacteria , and infants delivered by caesarean section may receive greater benefit from prenatal/postnatal probiotic supplementation that infants delivered vaginally . Evidence from animal studies clearly shows that maternal supplementation with prebiotics during pregnancy may reduce the features of allergic disease in the offspring. For example, in mice, maternal consumption of non-digestible oligosaccharides during pregnancy is associated with decreased dermatitis  and allergic airways disease [32, 71] and in pigs, as increased Th1 and Treg immunity . However, while there are a number of related trials in progress, the efficacy of prebiotic supplementation during pregnancy in humans remains uncertain. Meta-analyses have found no consistent beneficial effects from probiotic supplementation (either prenatal, postnatal or both) for prevention of asthma, rhinoconjunctivitis or food allergy [65, 67]. Thus, despite promising findings from some individual studies, it is difficult to recommend routine use of probiotics for allergy prevention . It is however important to recognise that probiotic effects are species-specific; consequently, pooling of studies that use different probiotic species in meta-analyses has been criticised . Indeed, even strains within one species may have very different biological properties . Only a small proportion of potentially suitable microbes have been evaluated. Almost all current probiotics are Gram-positive, with the exception of the E. coli strain Nissle [34, 76]. Our understanding of the impact of probiotics on the overall composition and metabolic activity of the gut microbiome is very limited. There is much to be learnt about the multitude of organisms yet to be evaluated as potential probiotics, including Gram-negative and anaerobic bacteria and parasites, alone and in combination, as well the importance of diet-microbiome interactions . This gap in knowledge provides an exciting opportunity for new studies to develop novel and sophisticated strategies for restoring a healthy microbiome. A range of epidemiological and mechanistic evidence supports the contention that the composition and metabolic products of the maternal microbiome play a key role in programming tolerogenic immune phenotypes in the offspring at birth in turn decreasing the risk of allergic disease and asthma. The mechanisms involved may include alignment between maternal and infant immunity as well as transplacental passage maternal IgG and microbial metabolites. There is also an evolving understanding of the importance of LPS variants and their interaction with the developing immune system, and the metabolite and cytokine milieu in which these interactions occur. Interplay between a ‘Westernised’ microbiome and the modern diet may be crucial. At present, however, there is insufficient evidence to support the implementation of interventions to manipulate the maternal microbiome during pregnancy for prevention of allergic disease and or asthma in the offspring. Given dramatic advances in our ability to characterise the composition and metabolic activity of the microbiome, studies are required that link direct measures of the maternal microbiome in humans, with immune phenotypes in the offspring and subsequent allergic outcomes. There has been a vast amount of work done on the infant microbiome, but the maternal microbiome during pregnancy remains relatively underinvestigated, particularly in humans, and may be of fundamental importance to the prevention of allergic disease and asthma in the modern environment.